As President Barack Obama noted in his address to the American people last week, recent developments in Pakistan are deeply troubling to U.S. interests both in the country and in the region. Without question, Pakistan is at best a difficult ally that poses some of the most complex and dangerous challenges to the security of the United States and the world. Not only is it a nuclear-armed state, but Al Qaeda, the Afghan Taliban and other militant groups have established safe havens in its territory from which to conduct terrorist operations in Afghanistan, and around the world. Pakistan itself faces growing instability as extremist elements have gained control in the border regions of the country and are extending their influence into Pakistan proper, threatening the integrity of a country that already suffers from widespread poverty, underdevelopment, and a fractious political establishment. The previous administration compounded Pakistan’s many problems by personalizing its relationship with former President Musharraf in order to gain his support for what the Bush administration labeled the “Global War on Terror.” Since 2001, the United States has provided more than $11 billion in unconditional aid to Pakistan—primarily in the form of Coalition Support Funds to the Pakistani military—without a coherent and government-wide strategy for how these appropriations would create a sustainable U.S.-Pakistani partnership. In order to build a more sustainable security, economic, and political relationship, I believe that Congress and the Obama administration must pursue a bold new approach, one that offers long-term and enduring aid and support to the people and institutions of Pakistan. The era of simply issuing a blank check to the Pakistani military in an attempt to purchase its cooperation in short-term counter-terrorism goals must end. This increased assistance to Pakistan’s civilian government must be paired with intensive diplomatic, intelligence, and military-to-military cooperation efforts as part of a broader regional strategy to assist Pakistan in tackling its growing insurgency, its weak governance, and its collapsing economy. Before providing a short list of recommendations on the future of U.S. engagement with Pakistan and the region, I will outline briefly the history of U.S. aid to Pakistan, and analyze current aid levels to the country. This will place these recommendations in their proper context. Over the past half century, the U.S assistance to Pakistan has been transactional and intermittent. Not surprisingly, this on-again, off-again history of U.S. assistance has left the Pakistani people and their leaders with serious concerns about the depth and reliability of the U.S. commitment to their wellbeing. As a result of a 1954 mutual defense assistance agreement, the United States provided nearly $2.5 billion in economic aid and nearly $700 million in military aid to Pakistan between 1954 and 1964. Since the United States first began its aid program to Pakistan, our assistance has come in many forms from a number of different agencies. Throughout the report, I have broken down our aid assistance into two broad categories: wide-ranging economic aid and purely military aid. It is important to note that the category of economic aid has historically included large amounts of Security Support Assistance, or SSA, as well as other security-related loans and grants. The Indo-Pakistani conflicts of 1965-1971 led the United States to suspend nearly all aid to Pakistan, as well as to India, assisting them almost exclusively with economic aid for the next 15 years—$1.45 billion in economic aid, compared to only $26 million in military assistance from 1965-1971; $1.1 billion in economic aid, and only $2.9 million in military assistance from 1972-1979. In 1979, the Carter administration suspended all aid to Pakistan—except for food aid—because of Pakistan’s development of a uranium enrichment facility. With the invasion of Afghanistan by the Soviet Union, U.S. assistance again increased dramatically, and this high level of aid continued throughout the 1980s as Pakistan became the intermediary and central staging ground for covert U.S. support to anti-Soviet forces in Afghanistan. Aid rose from around $60 million in economic and development assistance in 1979 to more than $600 million per year in the mid-1980s. In total, the United States provided more than $5 billion in aid—$3.1 billion in economic assistance and $2.19 billion in military assistance—from 1980 until 1990. While the United States pumped large amounts of aid into Pakistan and Afghanistan to help defeat the Soviets, concern within the United States about Pakistan’s nuclear ambitions led Congress in 1985 to pass the Pressler Amendment to the Foreign Assistance Act. The amendment named after former Republican Senator from South Dakota required the president to certify that Pakistan did not have a nuclear weapon for the fiscal year in which aid was to be provided. Throughout the 1980s, former Presidents Reagan and George H.W. Bush certified that Pakistan did not; however, in 1990 George H.W. Bush refused to confirm that Pakistan did not have nuclear technology, and as a result most economic and all military aid was cut off. Aid to Pakistan dropped dramatically from 1991 to 2000. In that period, the U.S. provided less than $500 million—$429 million in economic assistance and $5.2 million in military assistance. The United States also blocked major military equipment delivery, including approximately 28 F-16 jets that Pakistan had already purchased. Pakistan continued to receive only a small amount of economic assistance, mostly in the form of food aid and counternarcotics support. Aid to Pakistan was further restricted after its 1998 nuclear tests and General Musharraf’s 1999 coup. As mentioned before, this inconsistent history has led many Pakistan leaders to see the United States as a fickle ally. This was especially true after the withdrawal of the Soviet Union from Afghanistan in 1988 and the end of the Cold War when many leaders in this country mistakenly concluded that Pakistan had lost much of its strategic and geopolitical value. Aid levels reflected this belief. They dropped from $726 million in 1988 to $24 million four years later after George H.W. Bush refused to certify Pakistan did not possess a nuclear weapon. The George W. Bush administration’s expansive assistance to Pakistan in the wake of September 11 has been severely skewed toward military assistance. Of the over $11 billion dollars given to Pakistan since FY2002, 72 percent—or $8.1 billion—has been given in security-related aid. This includes Coalition Support Funds (or CSF, funds to reimburse Pakistan for its counterterrorism activities), Foreign Military Financing, and other military assistance. Meanwhile, only 23 percent—or $3.1 billion—has been given as economic-related aid. This imbalanced assistance has neither increased Pakistani nor American security. Moreover, a lack of oversight measures for CSF funds have allowed the Pakistani military to continue its history of underinvestment in counterinsurgency training and capabilities for the regular army and the paramilitary Frontier Corps, in favor of maintaining its traditional focus against its perceived regional rival India. Lay the groundwork for a new assistance approach to Pakistan while reviewing current programs. Pass the Kerry-Lugar legislation, the original version of which was cosponsored by Vice President Joe Biden. The legislation was endorsed by Secretary of State Hillary Clinton and President Obama when they served in the Senate. It would authorize up to $1.5 billion annually for five years without legislative conditions, as a pledge of our commitment to deepen and strengthen ties between the United States and Pakistan. This increase would come in the form of a multi-year aid authorization, and would be directed towards sectors such as education, health, infrastructure, agriculture, and economic development. This money should include increases to USAID and State Department auditing and organizational budgets to provide for the staffing and oversight necessary to implement the new funds effectively and efficiently. President Obama is right to call this the legislative centerpiece of his new Pakistan strategy. Continue aid and assistance to the Federally Administered Tribal Areas, or FATA, but conduct an assessment of its potential impact and incorporate the aid into a larger strategic framework. To date, the United States has pledged $750 million to the FATA, but concern remains over whether distributing such a large amount of money in a hostile area is even possible. The lack of governance and security in FATA means that the money could easily be used for nefarious purposes. The Obama administration and the Congress must assess whether this program should continue or whether the money should be shifted to other areas of Pakistan. The United States should also not fall into a trap of creating perverse incentives where it only rewards the insecure areas, and does not provide more aid to secure areas that show results. Provide financial and economic support during Pakistan’s economic emergency. The United States should encourage Pakistan to continue working with the International Monetary Fund to avoid defaulting on its foreign debt. Moreover, the United States should take the lead in convening an international conference to bring together donors and investors to assist Pakistan during its financial crisis and to provide a basis for its long-term economic stability. The Friends of Pakistan group summit, scheduled to take place in Tokyo this April, will offer key players such as Saudi Arabia, China, the United Arab Emirates, Japan, the European Union, the international financial institutions, the United Nations, and other key actors the opportunity to coordinate their assistance to the government of Pakistan for the purpose of resolving its current economic crisis. 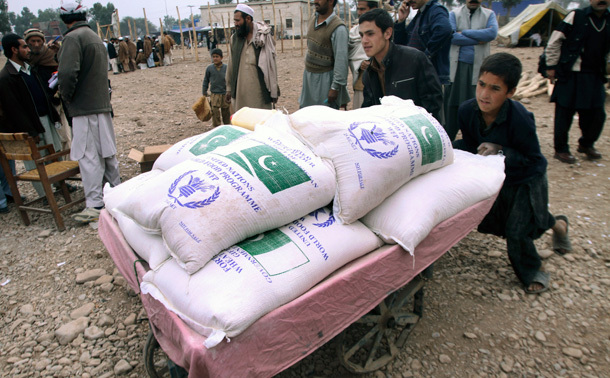 If needed, the U.S. government should also provide additional food aid to Pakistan through the United Nations World Food Program as part of a longer-term U.S. and international investment in agricultural production, and pass the Reconstruction Opportunity Zone legislation to allow indigenous Pakistani industries to develop their own capacity to build Pakistan’s economy through access to American markets. As part of the broader reform of the U.S. foreign aid and civilian diplomatic system needed to counterbalance years of underinvestment in our nonmilitary capabilities, The United States should create a comprehensive interagency development strategy for Pakistan. The United States must work with the Pakistani government and local civil society—alongside other bilateral and multilateral donors—to craft a development strategy in Pakistan that addresses Pakistan’s urgent economic crisis and the deeper sources of Pakistan’s under development. The United States should leverage additional assistance from the international community, and pursue a plan that is regional in scope, and in particular, linked to efforts in Afghanistan. An effective development strategy for Pakistan cannot be realized, however, without serious efforts to redress some of the many constraints on the effectiveness of the U.S. aid system. My colleagues at CAP and I, along with many other experts in and outside of government, have repeatedly called for such an overhaul as a key means to developing all elements of American power to the fullest extent of their effectiveness. The bureaucratic and organizational shifts necessary to overcome these constraints will require top-level leadership from the President and his cabinet if they are to be effective. As the most critical regional theater for American national security interests today, Pakistan and its neighbor Afghanistan offer the opportunity to serve as a model for such a reform effort. Improve the organizational structure of U.S. foreign assistance programs by consolidating assistance programs. There is no one single person that oversees and coordinates the operations of aid assistance programs. U.S. aid programs are fragmented across 25 government agencies, departments, and initiatives. This fragmentation undermines policy coherence and reduces its effectiveness. Create a cabinet-level position to ensure that the necessary leadership is provided to carry out the above reform and that the development aspects of policy are fully integrated into policy deliberations. Coordinate foreign aid with defense and diplomacy. The U.S. government aid agencies and the cabinet-level government departments handling diplomacy and security concerns need to work together to secure Pakistan, strengthen its economy and government institution, and improve social conditions. Fully fund the personnel shortfalls in the State Department and USAID. As of 2008, the State Department had a personnel shortfall of about 2,400 relating to enduring core diplomatic work, emerging policy challenges, public diplomacy, and critical training needs. Likewise, as of 2008, USAID had a shortfall of 2,200 personnel who administer more than $8 billion annually in development and other assistance (excluding cash grants) following cumulative staffing reductions of nearly 40 percent during the past two decades. Improve management of foreign contractors. Reassess the process of contracting aid to expensive foreign aid contractors instead of Pakistanis and consider building capacity within USAID. The lack of accountability and limited oversight capacity of USAID officers makes it extremely difficult to track aid projects. The private contractor’s method of implementing a project often reduces the efficiency of the aid that is provided to fund these projects, and host country contracting offers much greater prospects for building effective and sustainable development in Pakistan. A narrow, transactional relationship focused exclusively on U.S. security concerns has not built a broader strategic partnership between the two nations, and it has exacerbated Pakistan’s internal political problems to the detriment of U.S. interests. While the United States should be concerned about the new civilian government’s ability to formulate and enact policies, it should not undermine the democratic process. A new U.S. strategy toward the country must place a higher priority on engaging with a broader range of institutions, and working toward a new arrangement that, while more complex, will bring greater stability to the country in the long run. Should this coalition fail, U.S. leaders will have to work with its successor, and as such should retain contacts with the opposition. Ensure the president, prime minister, and representatives in the federal Cabinet are included in all discussions of joint U.S.-Pakistani policy. As head of the government of Pakistan, the prime minister remains the chief executive responsible for formulating and conducting national policy. The United States should interact with the Pakistani military as a component of the Pakistani government and not as an autonomous institution. U.S. policymakers should not be tempted to circumvent the new and sometimes less-accommodating civilian leadership by relying excessively on direct military-to military or agency-to-agency contacts. Express explicit support for a professional, depoliticized, well-equipped Pakistani Army capable of defending the country from both internal and external threats. Pakistan’s own politicians and even its army chief have articulated these same objectives. The United States should support a military establishment under civilian control and with clearly delineated lines of operational authority. Support institutional reforms to gradually bring Pakistani military and intelligence agencies under greater civilian control. Encourage the Pakistanis to create a coordinating framework within their National Security Council for civilian, military, and intelligence institutions. Use money from the proposed Kerry-Lugar legislation to fund projects that promote fair and democratic governance, including an independent judiciary, anti-corruption efforts at all levels of government and the legal system, and transparent accounting by all branches of government. The overwhelmingly military nature of current U.S. aid to Pakistan shows its people where American priorities lie, and fails to effectively counter the long-term drivers of instability that plague the country. This legislation addresses the imbalance in aid. Support Pakistan’s judiciary. While recognizing the sensitivity of direct U.S. involvement in this issue, the United States should encourage a reform program that maximizes judicial independence from both the presidency and the elected parliament. Corruption and the slow or incomplete provision of justice directly harm the Pakistani state by undermining the legitimacy of the government. The United States should call on the Pakistani parliament to carry on promises made by President Zardari, following his inauguration, to restore the balance of power in the Pakistani constitution by amending Article 58-2 (b), which grants the president disproportionate powers of office. The United States should also encourage President Zardari to follow up on his promise to institute a Judicial Commission to guide high court appointments, as called for in the May 2006 Charter of Democracy. Solicit assistance from other international partners for strengthening Pakistan’s civilian institutions. The United States and Pakistan should seek additional nonmilitary assistance from other international partners for Pakistan’s judiciary and civilian institutions, especially key Pakistani allies such as Turkey, Japan, and the European Union. Many of these countries and organizations are already providing aid to individual programs, but greater coordination of efforts must occur.